Electric Storytime: BLACK FRIDAY BLUES: A FUZZY-WUZZY CLUB ADVENTURE! BLACK FRIDAY BLUES: A FUZZY-WUZZY CLUB ADVENTURE! It was just before dawn on the day after Thanksgiving. Farthington Bear, Priscilla Piglet and the rest of the Fuzzy-Wuzzy Club were waiting outside Wal-Mart with hundreds of other excited shoppers. "Oh boy oh boy!" exclaimed Farthington Bear, rubbing his tiny paws together to keep them warm. "I can't wait to get a big ol’ plasma television for our tree house. Then it will be the very best tree house in all of Rainbowville! All the other animals will want to be our friends! 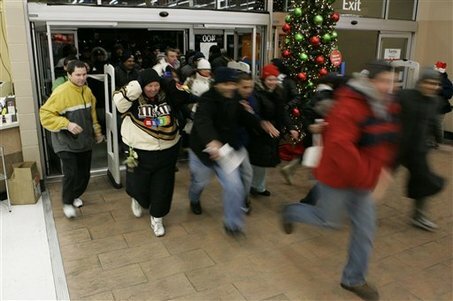 Hooray for Black Friday!" "Thank goodness we made so much money at our bake sale!" added Priscilla Piglet. "My yummy hot chocolate and rhubarb tarts were the stars of the show!" "I sure could use some of that hot c-c-chocolate right about now," sputtered Timmy Turtle. "M-m-my reptilian b-b-blood is feeling icy cold!" Suddenly, the crowd erupted in cheers and squeals of delight as a blue-vested man unlocked the doors. "Yikes!" cried Timmy, who was kicked upside-down and sent skittering across the floor by innumerable pairs of stampeding feet. "I'll see you in the electronics department!" he called out to his friends as he disappeared into the tumult. The rest of the Fuzzy-Wuzzy Club waited politely until all the other frenzied shoppers had charged past them. Then they made their way to where the televisions were, careful to avoid several bloody brawls. “When we have our television, I’m going to watch cartoons all day!” cried Oliver Otter, his black whiskers twitching in anticipation. “And I will watch the Recipe Channel, so next year’s bake sale will be even better!” said Priscilla Piglet, her oinks barely audible above all the screaming and crying and sounds of shattering glass. But when they arrived at the electronics department, they were sad to discover that all the televisions were gone! “Oh fiddlesticks!” sobbed Farthington Bear. “Now we shall have nothing to do all winter!” Mr. Possum suggested that they spend the morning playing charades or drawing in their coloring books, but even he had to admit that watching television would have been much, much better. As the dejected little animals began walking back to the entrance, they saw that aisle after aisle had been stripped bare. Shelves had been smashed to pieces; some were on fire. And all of the most popular toys were gone. All of the unpopular ones, too. Soon they came across several women tugging ferociously at the store's very last Miley Cyrus animatronic unicorn. One of the women stopped and stared at Farthington Bear and his friends. 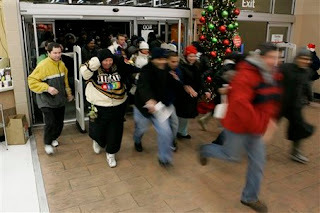 And so the woman and her big horrible family and a mob of other empty-handed shoppers began chasing the members of the Fuzzy-Wuzzy Club around and around the store! Eventually, everyone managed to get away -- everyone, that is, but poor Farthington Bear, who was so very slow because he had eaten too much Thanksgiving dinner.